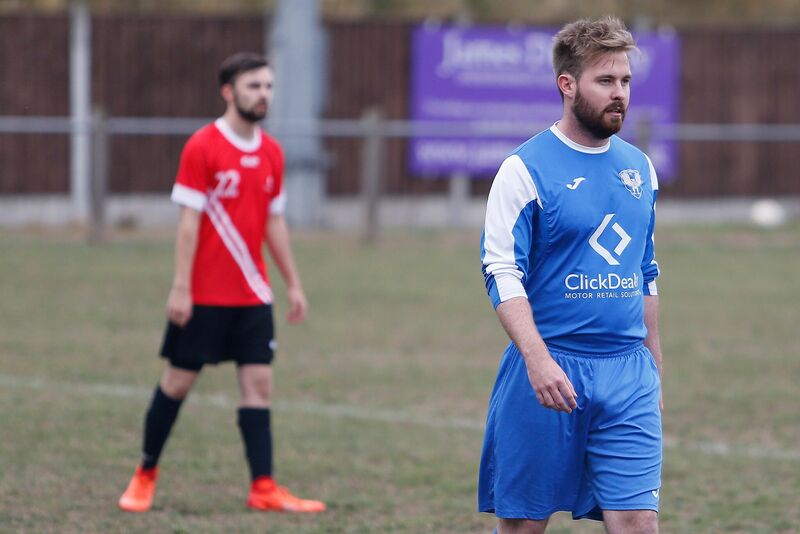 HomeBlogCharitable WorkClick Dealer Beat Codeweavers 6-5 in Jude’s Rimet Trophy Thriller! 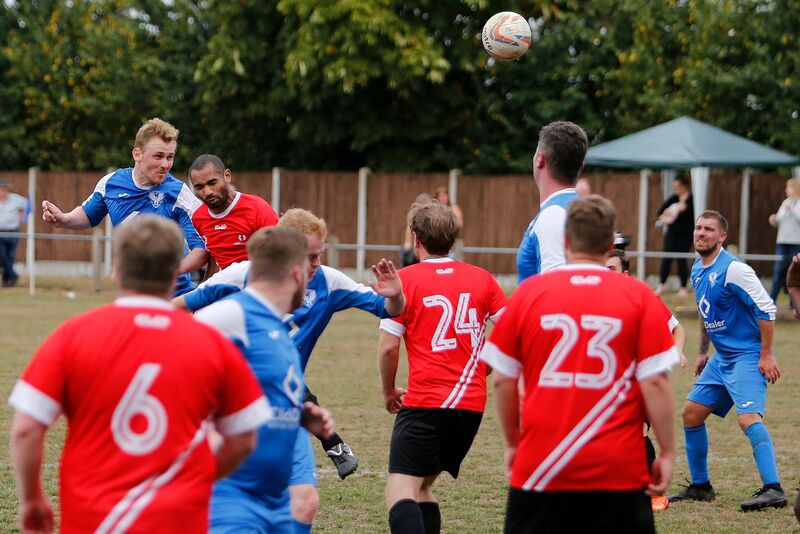 Hundreds packed into Pershall Park on Sunday afternoon to witness Click Dealer take on Codeweavers for the Jude’s Rimet Trophy and they weren’t disappointed with the spectacle provided by the two automotive software giants! 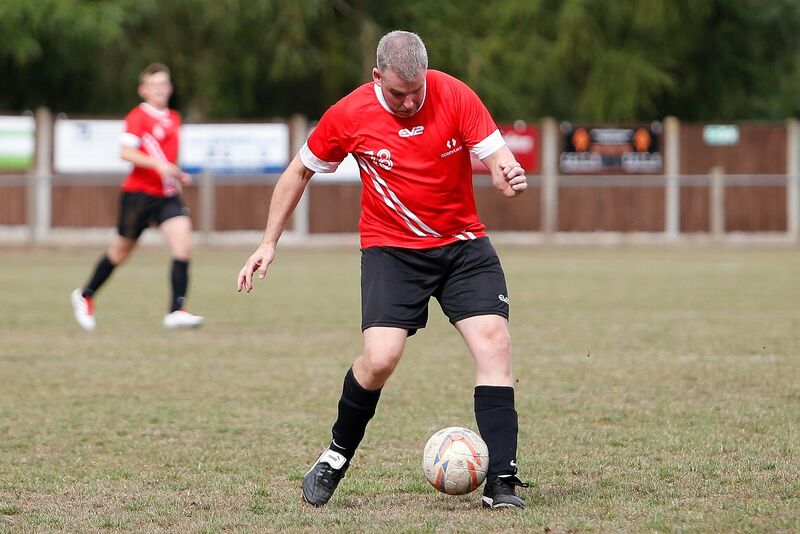 The match was the main focal point of Click’s charity ‘Family Footy Fest’ held at Eccleshall FC, in aid of Leighton Hospital’s Ward 17 and the latest in their long list of fundraising challenges to help raise £20,000 for the trust. Lee Rawlinson and Son Jude, the inspiration behind the trophy, lead the teams out for the big match! In what was an end-to-end game, both sides made bright starts and had opportunities to open the scoring but it was Click Dealer’s midfield maestro, Jack Ganley who went the closest to breaking the deadlock, his free kick was destined for the top-left hand corner before a fingertip save from Codeweavers keeper Joe Williams diverted the ball onto the crossbar and out for a corner. 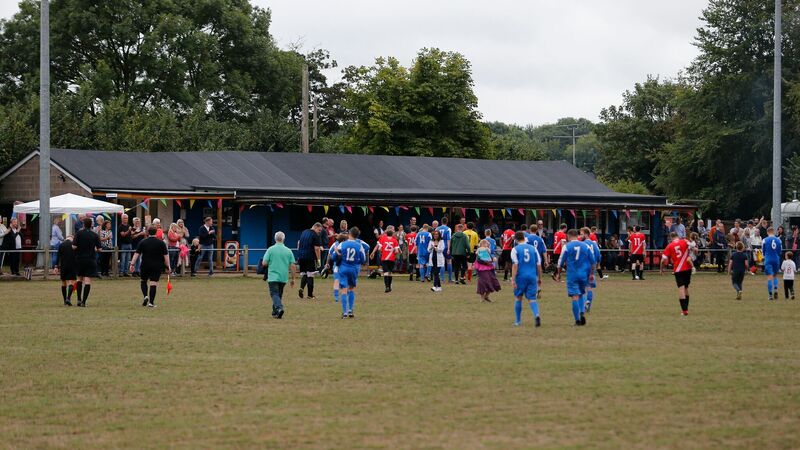 After a quarter of an hour, it was the Codeweavers supporters who were celebrating when a long-ball over the top was fumbled by Click Dealer keeper, Jake Mallin, the Stafford based outfit’s Operations Director, Craig Judson, pounced to bundle the ball home, much to the delight of their travelling faithful, who were vociferous throughout the affair! Codeweavers’ Craig Judson capitalised on Jake Mallin’s fumble. The introduction of skilful attacker, Hassan Ali for The Clickers after 20 minutes began to tip the game in their favour, as the Crewe born forward caused numerous problems for the Codeweavers backline. With just five minutes of the first third remaining Joe Podmore’s exquisitely floated corner was met by the head of burly centre-forward, Jamie Baker, and powered into the top left-hand corner of the net, despite the best efforts of Codeweavers keeper, Williams to keep it out, and The Clickers were level. Jamie Baker rose to power home Click Dealer’s equaliser. In what was a double sucker punch for Codeweavers, The Clickers kept on applying the pressure, buoyed by their equaliser and as another Podmore corner evaded everybody in the box, it was Baker once again who ghosted in at the back post to volley home left-footed from what looked like an unworkable angle to give Click Dealer the lead for the first time in the match! The second third began the same way the first ended, with Click Dealer in the ascendancy. Jack Ganley’s slide rule pass split open the Codeweavers defence for Jamie Baker to race through on goal and smash home his hat-trick, giving Click Dealer a two-goal cushion. 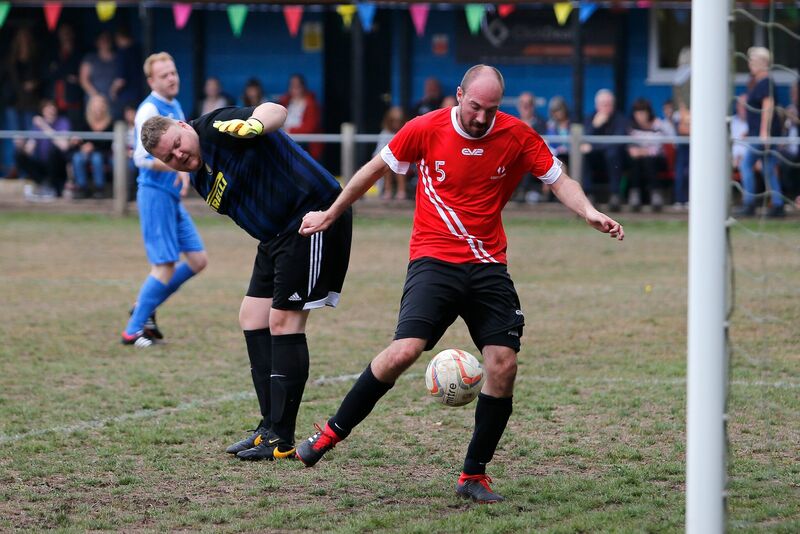 Bustling target-man, Jamie Baker blasts home his hat-trick goal. 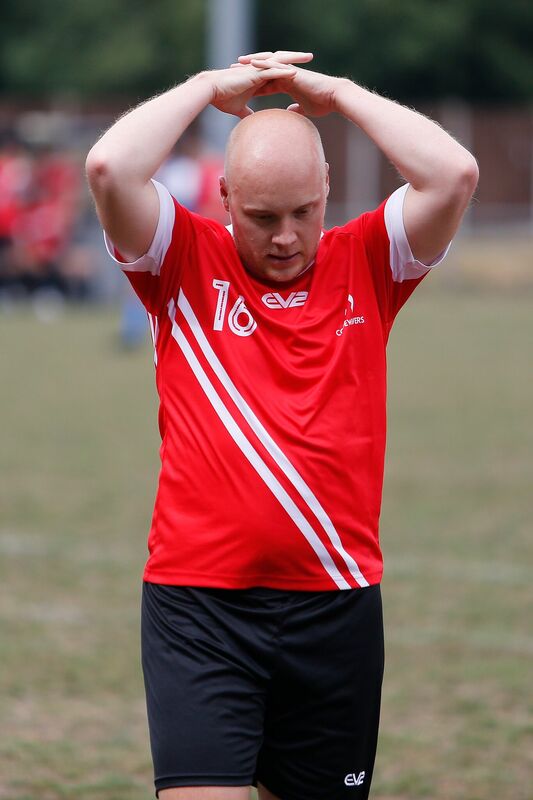 The Clicker’s joy was short-lived as combative midfielder, Joe Podmore was given his marching orders for a late challenge on a Codeweavers midfielder and his 10-minute sin-bin, left his side weakened and vulnerable and Codeweavers were quick to capitalise. 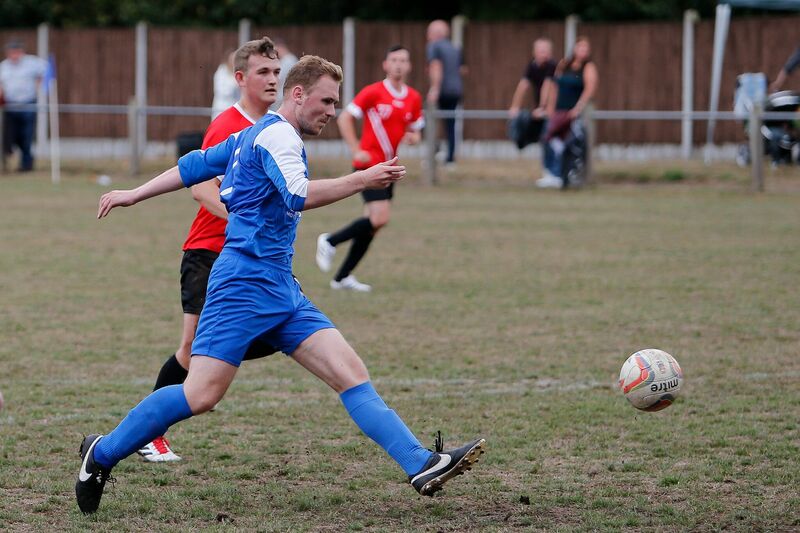 Click Dealer midfielder, Joe Podmore put in an all action display, capped with four assists! 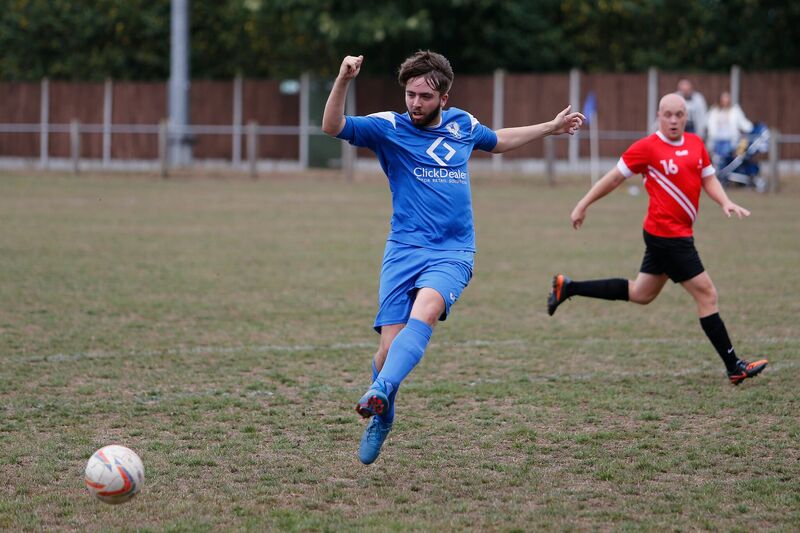 Adam Canay blasted home Codeweaver’s equaliser from 20 yards. And with that, the two sides went in level after the second third, with just thirty minutes left to play to try and avoid the dreaded penalty shoot-out. With Podmore back on the pitch, The Clickers came out all guns blazing once again in the final third and within minutes of the restart, Lee Rawlinson’s cross was dropped by Joe Williams, for the only blip of an otherwise stunning performance from the Codeweavers keeper and Hassan Ali was on hand to turn the ball into the back of the net and put Click Dealer 4-3 up! Hassan Ali bundled home Click Dealer’s fourth goal in an all action performance. But the topsy turvy game showed no signs of slowing down there and it wasn’t long before Codeweavers were back level. 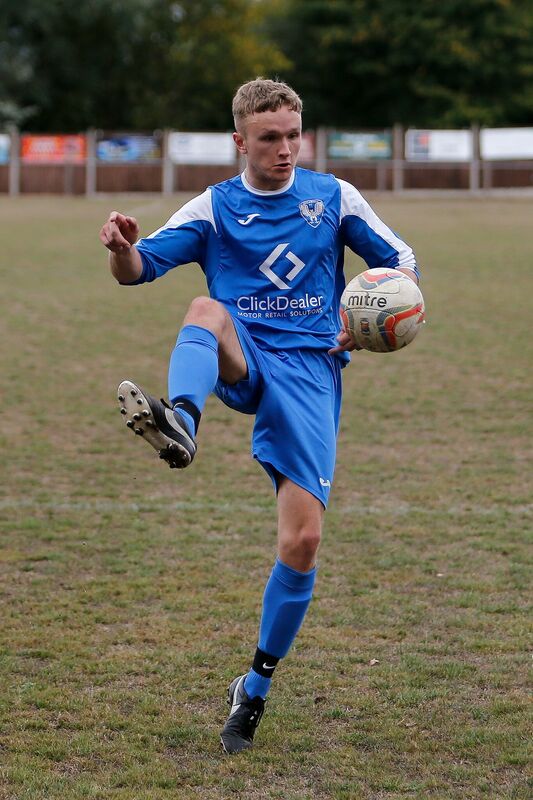 After getting in behind the Click Dealer defence, skilful winger, Elliot Evans lobbed the oncoming Jake Mallin and despite Click Dealer Director, Ollie Moxham’s efforts to clear the ball off the line, it sliced off his boot and trickled in to make the score 4-4 and setup a grandstand finish to the game. Elliot Evans lobbed home Codeweavers’ fourth goal of the game. With time running out and penalties looking a distinct possibility to separate the two sparring sides, another pinpoint Podmore corner was met by a near post run from his midfield partner in crime, Jack Ganley with a bullet header into the top-right corner of the net, giving Williams no chance and putting The Clickers 5-4 up! Jack Ganley leapt high to nod in Click Dealer’s fifth goal from another Joe Podmore set-piece. 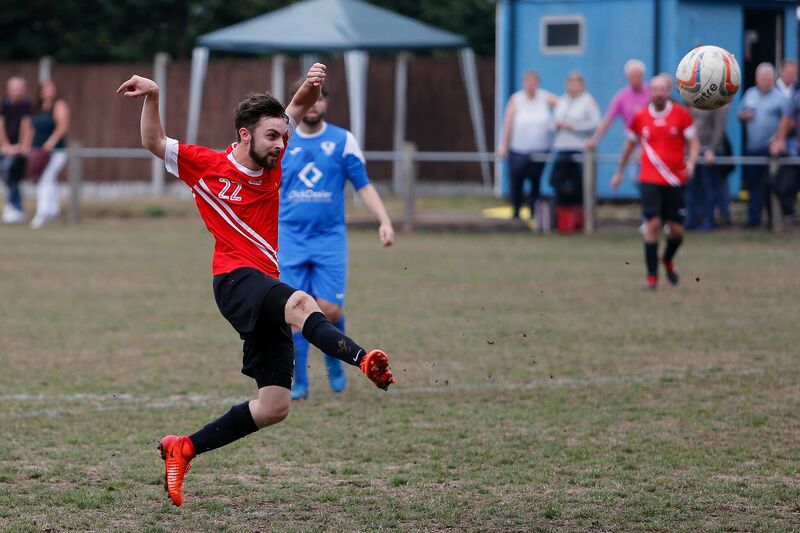 Minutes later, another trademark Podmore corner-kick routine paid off, this time it was Father to be, Keiran Munn who rose high to power home a stunning header and provide another example of his scoring prowess! The Wolverhampton native wheeled off in jubilant celebration after restoring Click Dealer’s two goal lead and seemingly putting the game to bed. Keiran Munn rose like a salmon to head home The Clickers’ match-winning goal! Codeweavers continued to fight to the bitter end though and their perseverance was rewarded when Click Dealer centre-half Ben Wood threw them a lifeline by inadvertently lobbing his own goalkeeper to make the score 6-5 with a nail-biting last two minutes still to go! 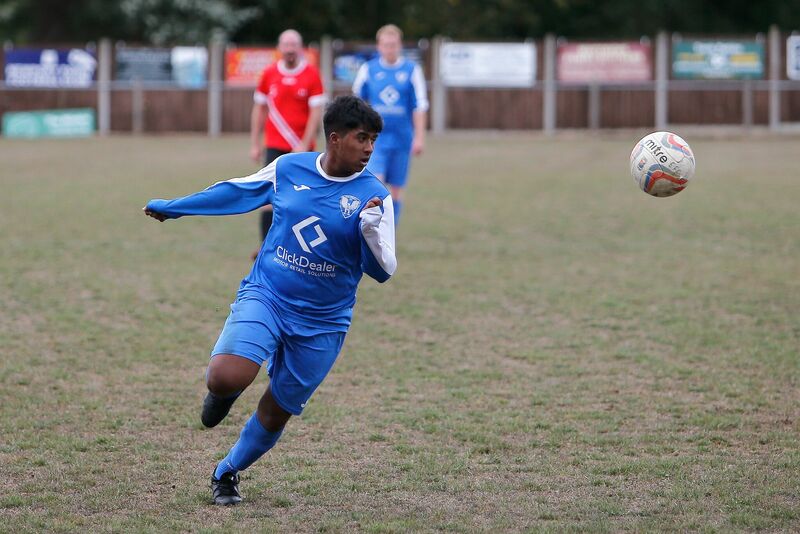 Ben Wood’s spectacular own-goal gave Codeweavers a late lifeline! The Clickers cleared their lines as best they could but they were dead on their feet after an all action display and with seconds left on the clock, Jack Davenport glided past two defenders before curling a tremendous shot inches past the far post in an agonising final attack for Codeweavers. Jack Davenport almost equalised for Codeweavers with a stunning effort just seconds from time. But in the end, it was Click Dealer who held on to win the inaugural Jude’s Rimet Trophy match, with Captain, Jamie Baker lifting the cup in front of a delighted crowd. 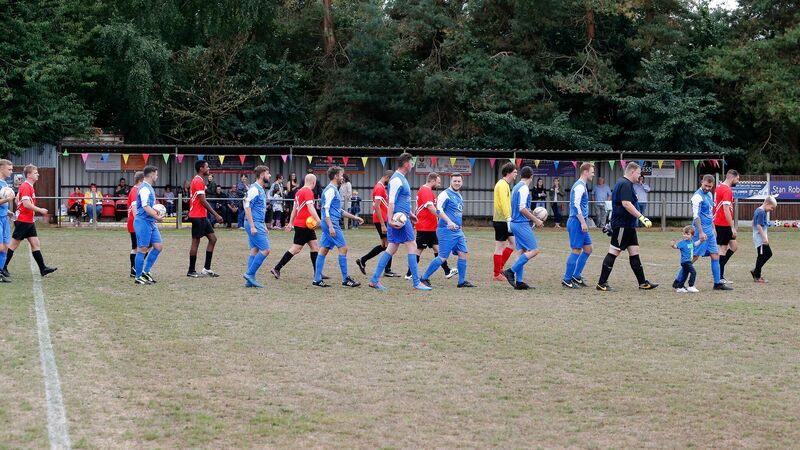 Click Dealer clinched the inaugral Jude’s Rimet Trophy after a dramatic 6-5 win over Codeweavers at Pershall Park. 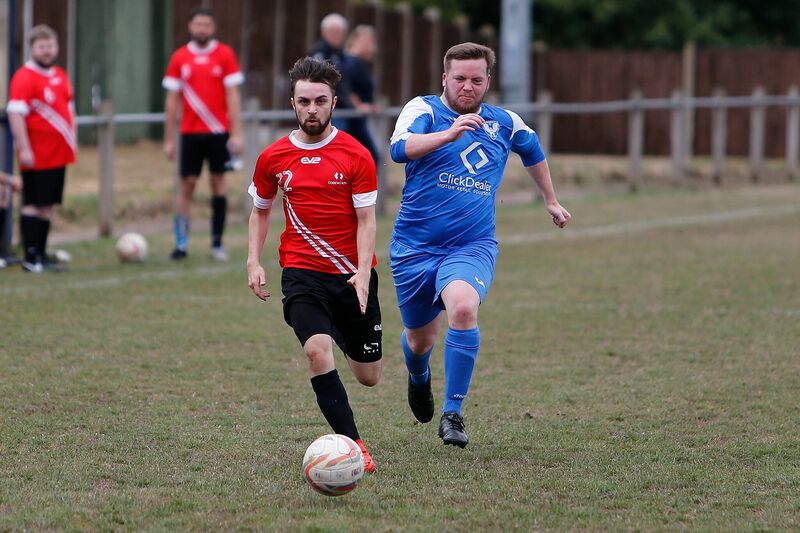 Over £1,600 was raised for Leighton Hospital’s Ward 17 thanks to Click Dealer’s Family Footy Fest and The Clickers would like to extend a huge thank you to Codeweavers and their friends and family for supporting the event, we couldn’t have done it without you! Great match report! Disappointed to have missed a great event and exciting match. Delighted the result went Clickers way!